Citation Information: J Clin Invest. 2012;122(8):2711-2719. https://doi.org/10.1172/JCI62423. Alarmins are endogenous molecules that are constitutively available and released upon tissue damage and activate the immune system. Current evidence indicates that uncontrolled and excessive release of alarmins contributes to the dysregulated processes seen in many inflammatory and autoimmune conditions, as well as tumorigenesis and cancer spread. Conversely, alarmins have also been found to play a major role in the orchestration of tissue homeostasis, including repair and remodeling in the heart, skin, and nervous system. Here, we provide an update and overview on alarmins, highlighting the areas that may benefit from this clinical translation. Alarmin pathway as potential therapeutic target in the innate inflammatory cascade. The upstream alarmin signaling pathways are potential therapeutic targets for immunomodulation in both acute and chronic inflammatory diseases. This has been achieved in animal models by directly targeting the alarmins using antibodies or competitive inhibitors, e.g., Box A (HMGB1), or by targeting the pattern recognition receptors (PRR) with antibodies or soluble decoy receptors. The convergence of S100 proteins and HMGB1 onto their receptors may be a rate-limiting step in this pathway and hence represents an attractive therapeutic target. 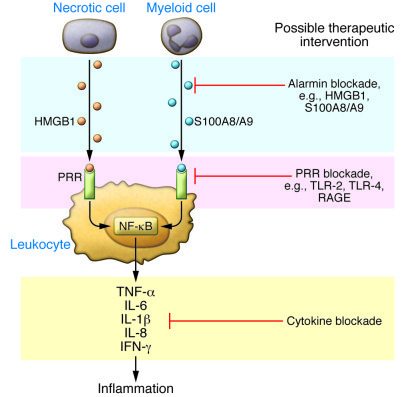 Downstream cytokine blockade, including of TNF-α and IL-6, is used clinically in the treatment of chronic inflammatory diseases such as RA and inflammatory bowel disease, but remains ineffective in a significant proportion of patients. Cytokine blockade has been notably unsuccessful in patients with acute inflammatory disorders.